It's even more epic than season one! It was the year 1983, in Hawkins, Indiana when a young boy, Will Byers, vanished. Friends, family, and local police searched for answers, but instead, they found a top-secret government lab, terrifying supernatural forces, and one very strange little girl. One year later, Will has been found, and everything is back to normal—or is it? 1984 brings the original Apple Macintosh computer, the assassination of Indira Ghandi, and a bigger and scarier threat to Hawkins. Season one was pretty epic. Season two? Even more EPIC. 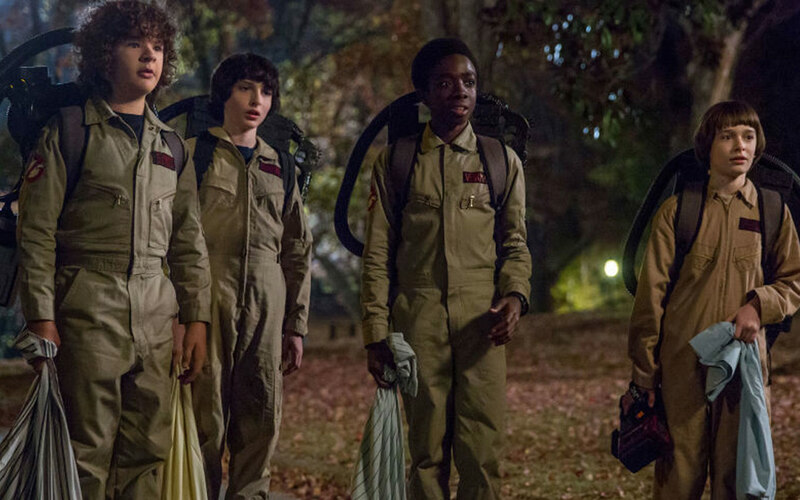 The gang goes Ghostbusting, the party gets bigger, and so does the hair. An It girl of the '90s, she's been doing a lot of TV movies and mini-series in recent years, but Stranger Things put her back in the limelight. Who doesn't remember Samwise Gamgee from Lord of the Rings? He's been doing a lot of TV since leaving the Shire: The Librarians, Justice League Action, and Teenage Mutant Ninja Turtles. He's one of those actors who's been in a LOT of stuff: TV's The Newsroom and Law & Order: Criminal Intent, and big Hollywood blockbusters Quantum of Solace and Suicide Squad. Next year, he'll be playing Hellboy! Before his big break, he was in The 100 and Supernatural. Just this year, audiences saw him in the remake of Stephen King's It. The young British actress was previously seen on The Intruders and NCIS. In 2019, fans will see her in Godzilla: King of Monsters. But there's also a clamor for her to play young Princess Leia in the Star Wars movies. Everyone's favorite scene-stealer started on the TV showThe Blacklist. Caleb McLaughlin as Lucas Sinclair. Acting on TV since 2012, he made appearances on the TV shows Law & Order: Special Victims Unit and Blue Bloods. He gave voice to Charlie Brown in The Peanuts Movie and was in Bridge of Spies with Tom Hanks. He also made a stop in Manila for the Asia Pop Comic-Con in August. She played Suzanne Ballard on American Odyssey and Lori on The Glass Castle. She was also on the Netflix comedy series, Unbreakable Kimmy Schmidt, and attended the Asia Pop Comic-Con in Manila. You might have seen the young actress in Hannah Montana: The Movie. He's done a few TV shows and movies, but you might be excited to see him in next year's The New Mutants. This Australian cutie is most known for his role as the Red Ranger in the recent Power Rangers reboot. He was also in Manila for Asia Pop Comic-Con. He was on the TV shows Chicago Fire and Empire, and was also in Manila for Asia Pop Comic-Con. 1. There are a lot of Stephen King references in the series: It, Firestarter, The Mist, and Stand By Me. Actually, there are TONS of pop culture references across season one and two—from Star Wars and Ghostbusters to Alien and E.T. They also touch on the roleplaying game Dungeons and Dragons, '80s arcade games, John Carpenter's The Thing, and horror series A Nightmare on Elm Street. 2. Since Netflix released the episode titles early this month, fans have been trying to figure out links between the titles and what they saw in the trailer. 3. The young actors don't know much about the '80s. Okay, this is understandable because most of them were born in the 2000s. 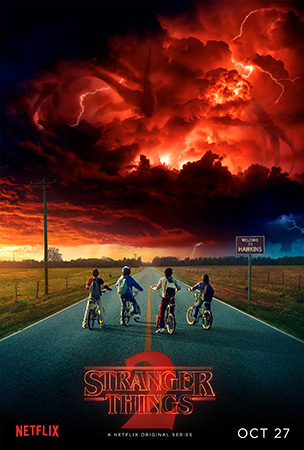 Show creators The Duffer Brothers made them watch a lot of '80s movies to prepare for the show, including E.T., Stand By Me, The Goonies, Sixteen Candles, and The Breakfast Club. 5. Millie Bobby Brown actually hates Eggo waffles! Season one had a tight and well-written story. Surprises and plot twists were evenly distributed, and each character had an important role to play. Season two has a lot of the elements you loved in season one. The party of four is still witty and funny. Yes, Dustin and Lucas steal the show, while Will and Mike are the heart of the story. Nancy is conflicted about Steve and Jonathan. And you've got neurotic mom Joyce Byers and the protective Jim Hopper. There are a few new characters to watch for in the new season. Sean Astin's Bob is adorable, and fans of the 1986 Aliens movie will get a kick out of seeing Paul Reiser. And of course, there's Sadie Sink's Max, who will most likely be a champion to geek girls everywhere! If you really loved season one, you probably won't mind the meandering plot. So, enjoy! I liked that they spent more time developing the characters' relationships and motivations. We got to know them better from season one. But it felt like they were forced to involve all the characters introduced in season one because the show became so popular. Stranger Things is loads of fun for barkada viewing—especially if you love scares and screams. It's great for a marathon since all nine episodes dropped on Netflix on October 27. So, gather the gang, make sure you have a great internet connection, and toss some popcorn in the microwave!